From Budapest to Amsterdam, I journaled our river cruise every day for our entire 15-day trip. It was a helpful great record of what a European river cruise is really like. This was my first entry, the good, the bad and … you know the rest. I hope you enjoy my tale. Today was check-in day on Viking Bragi, the ship that will take us on our Budapest to Amsterdam river cruise. Lucky us: While other passengers were struggling with flights and transfers, we had the morning to ourselves and could walk to the ship at our leisure. Planning ahead pays off on a river cruise. Few things could be worse than missing embarkation because of a flight delay. What a nightmare that would be! We decided to arrive a few days before our cruise. That would not only ensure arriving on time but also give us time to adjust to the time change. Viking's pre-trip literature mentioned that all Viking ships dock on the Pest side of the Danube. 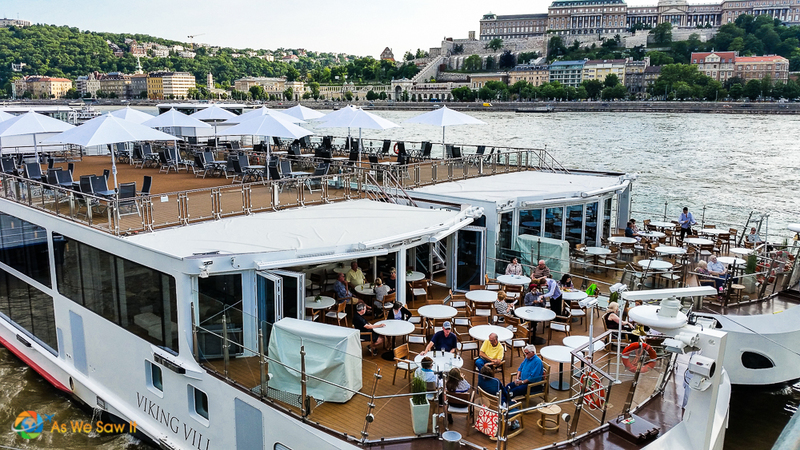 We booked two nights at the Budapest Marriott, which looked like it was “right there.” If we didn't see it right away we figured that we would stroll along the waterfront on our second day and read the names of the ships. We were right. Here's a view of the river from the hotel. It was incredibly easy to spot the Bragi: The ship was conveniently docked directly next to Chain Bridge, mere blocks from our hotel. 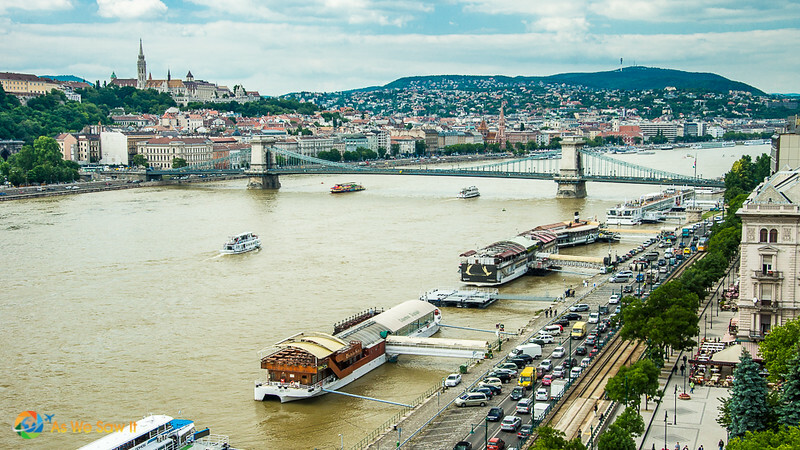 Chain Bridge is Budapest's best landmark; it was the first bridge to connect both sides of the city. As I stood on the bridge, it occurred to me: The ship was so close that a risk-taker could probably jump from the bridge onto the Bragi's Aquavit Terrace. Landing on the chairs would hurt, though. I shuddered at the notion. We took our sweet time that morning savoring the hotel’s delicious breakfast buffet and scenic view as long as we could, then rolled our carry-ons down the sidewalk to the ship that would be our home for the next two weeks. The crew had barely had a chance to see us before they were rushing over to take our backpacks and carry-ons. “Is that all you have?” they asked, incredulous. You should have seen their surprised smiles when we nodded yes. “You need to teach all our other passengers how to do that!” they joked, and our bags followed us aboard. No sooner had we crossed Bragi's threshold than we were greeted with a cool washcloth and a refreshing drink. The entire check-in process took only a few, brief moments, just enough time for them to check off our names, hand us our room keys, and take our bags with a promise that we would find our luggage in our stateroom by 3:00 pm (their official check-in time). Meanwhile, we were welcome to enjoy a light lunch upstairs on the Aquavit Terrace. And perhaps later, she continued, we would also fancy joining a brief, guided afternoon walk around the area? It all sounded good to us. Standing nearby was a man dressed in a nautical-looking outfit and a name tag saying Felix Anheier. We introduced ourselves and shook hands. Felix introduced himself as the Hotel Manager and smilingly joked that he was Bragi's token German. It seems Viking's HR must have high standards, because he had worked in an exclusive luxury hotel in Bavaria before signing on with Viking. The “jet-lag buster” walking tour for early passengers was a brief, 45-minute overview of the area around our ship. It was designed to be just enough for guests to get oriented, so they could feel comfortable exploring on their own without fear of getting lost. When the tour ended we walked to Saint Stephen’s Cathedral, hoping to see and photograph his mummified right hand. Unfortunately, the cathedral was closed to tourists because they were having a series of private ceremonies. Apparently, May is the traditional month for weddings in Hungary. We were permitted to stand inside the door to take photos, as long as we promised to be quiet. Hungary is known for the quality of its wines; its Tokaj wine region is even a UNESCO site. With such a stellar reputation for its wines, we couldn't resist stopping into a bistro-wine bar we passed, to sample a few varieties of local reds. Not knowing what to expect, we enjoyed the experience, sipping our selections slowly and watching the passersby until it was almost time to return to the ship. After paying our bill, we sauntered to a grocery store we had seen. Viking allows passengers to bring wine on board to enjoy, and as wine is readily available in shops we decided to get a bottle. I also secretly wanted to pick up a useful souvenir or two as a little treat. Dan enjoys recreating our favorite local dishes once we get home. The shop was doing a brisk business as we entered. We walked around to see what foods are popular. 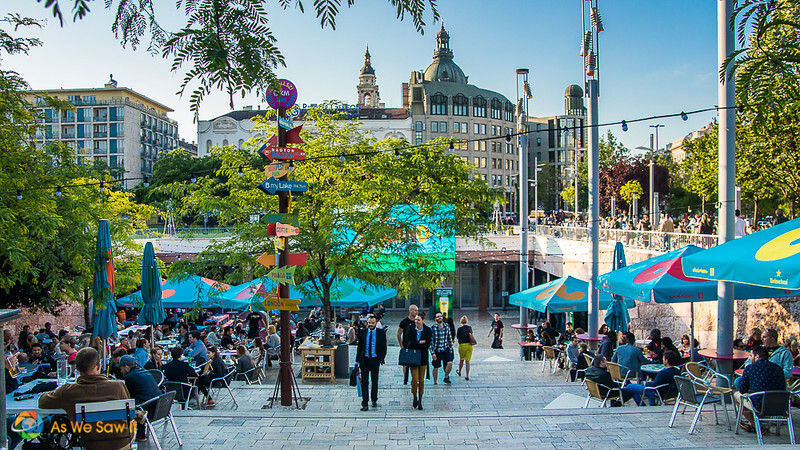 Yes, my friends, we consider that fun, and yes, Budapest's food is cheap. They had a nice wine department, too. You should have seen us attempting to decipher the grapes and varieties! While Dan was distracted I sneaked off to pick up my souvenir treat for Dan. My plan was to drop a few packages of Hungarian paprika next to the wine when he went to check out. Surprise! Do you know, I looked and looked on the spice rack and could not find the paprika anywhere! No paprika? In Hungary? Impossible! I shook my head in disbelief. They use that more than salt, for Pete's sake. An old woman ambled over, basket in hand, and I watched her select a packet of something. Whatever it was, it wasn't what I needed. I touched her arm. “Paprika?” I asked her, gesturing. Happy to help, she began to search for it, then called a shocked “Nincs paprika?” to a clerk, who rushed over to rescue us. “Oh, there you are.” Dan's voice caught me by surprise just as the clerk pointed to a separate section with three rows of the precious red powder. I thanked the old woman in the one Hungarian word I knew and she smiled and left. Busted. I asked him to select the packets we'd bring back to the U.S. Tip: Both wine and paprika make inexpensive souvenirs. For good selection and freshness, buy them in a local grocery store … and while you're there, look around the grocery itself. It's interesting to see what the locals prefer to eat and prices of their foods. Some of the produce and meats are different, too. People gathered in the Lounge before dinner to introduce themselves and meet Dewi, Bragi's delightful (and pretty) Dutch Program Director. She was there to give a Welcome Briefing. Her name is pronounced Davey. It's the Indonesian version of the Hindu devi, meaning “goddess.” What a conversation starter! Dewi gave us an outline of what to expect on our cruise, told us about optional tours we could take in the next few days, and gave us a heads-up that Viking would ask for our feedback at the end of the cruise. After the briefing we met our Cabin Steward, Florin, a friendly chap from Romania. He asked us if we had everything we needed and requested that we please let him know if we needed anything else. Taking advantage of his offer I asked him for a couple of bathrobes. He offered to bring slippers as well. Well, slippers hadn't occurred to me but, “Yes, that would be nice. And do you have any firmer pillows?” The ones on our beds were way too soft, not to mention small. Seriously. Those things would be flattened into pancakes within minutes of meeting our heads. I made a mental note to mention the inadequate pillows when it came time to fill out the Guest Survey. We met the Maitre d' before dinner, a smiling Filipina named Ria. Thanks to the preferences sheet we'd filled out before the cruise she already knew about our dietary restrictions (no pork, seafood, wheat). Ria promised to do all she could to ensure our meals would be perfect. If tonight's menu was any indication, we were all going to have a hard time maintaining our weight. The menu options were quite varied, and it was nice to see vegetarian and regional specialty dishes. More importantly, our food was absolutely delicious. 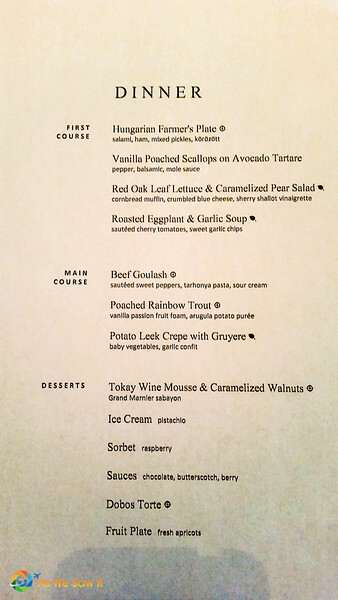 Here's our menu. What would you choose? Some cruise lines include unlimited alcohol in their fare. Viking, however, does not. Wine, beer, soft drinks, and juices are available with lunch and dinner but at other times you have to pay for them. That said, Viking does offer a Silver Spirits Package that entitles you to unlimited sodas, juices, beers, and premium liquors and wines whenever you want them. 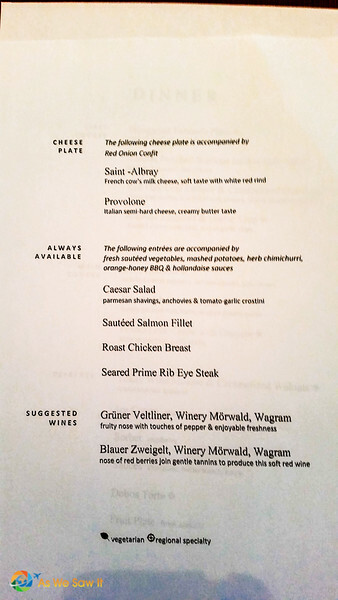 The standard wines they serve at dinner come from Mörwald Winery, which they own. Non-drinkers might find that adequate but we wanted to try a wider variety. 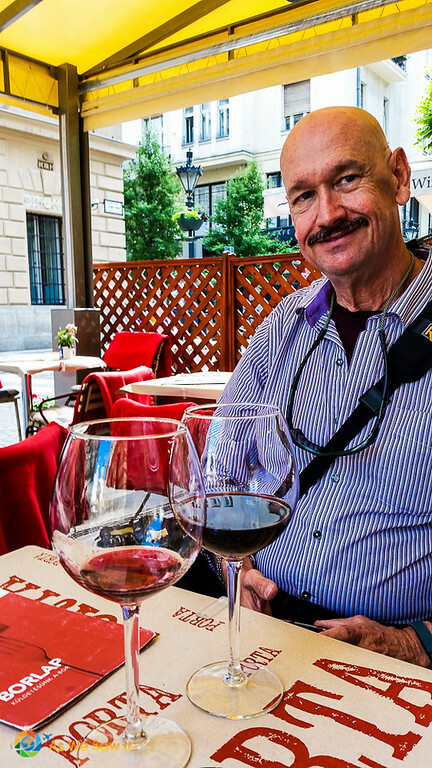 Eastern European wines are hard to find in the U.S. and they use different grape varieties. Besides, we were on vacation and wanted to enjoy an afternoon cocktail and perhaps an after-dinner drink as well. Maybe even two. The package cost €299 per person on our cruise (2015 price). When I did the math, it worked out to about 20 euros per day, per person. Your mileage may vary but personally, I would prefer to pay one flat fee up front and not have to worry about a hefty final bill. Back in our room we found a copy of today's Viking Daily on our bed. This is the ship's daily newsletter, with a schedule of tomorrow's activities and lots of information about the next day's destination. Our newsletter was accompanied by two robes and slippers, and larger, firm pillows awaited us. It's the little things that can make or break an experience, wouldn't you agree? What a great way to begin a cruise. 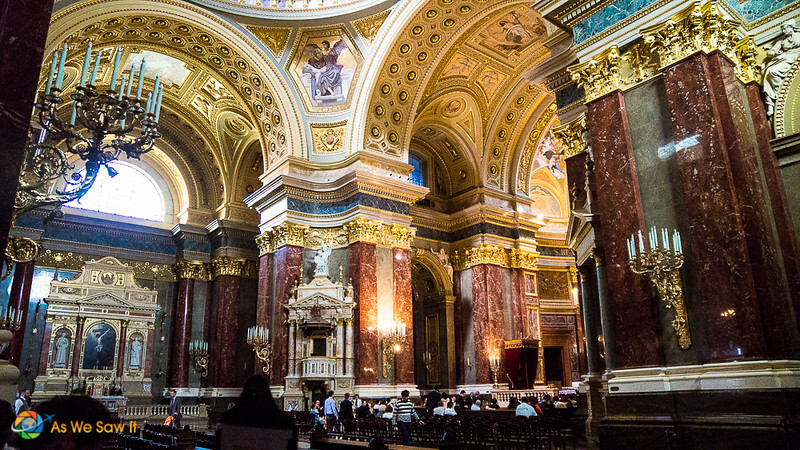 For more photos, please see our Budapest photo gallery. Save this article for later; pin it to your Pinterest travel board. Note: As is common in the travel industry, Dan and Linda were provided with a complimentary cruise package for the purpose of review. While it has not influenced coverage, AWSI believes in full disclosure. For more information, see the Disclosure page. So sensible to arrive a few days early not only for flight delays, but luggage can get lost and what a nightmare to head off on a cruise without that. Plys you really got to explore your departure. So true, can you imagine how difficult it would be to retrieve your luggage after you had sailed? Yikes! All of these sound fabulous! I will arrive a couple of days before boarding a cruise too. I cannot imagine the stress of being against the clock in case something goes wrong. I like the surprise you gave the crew with your light luggage. I can imagine the things those poor guys have to carry. IMO it’s crazy to bring tons of luggage. It’s much simpler to bring only the things you are sure you’ll need and avoid “just in case” packing. After all, they do have stores in Europe! You’re welcome. 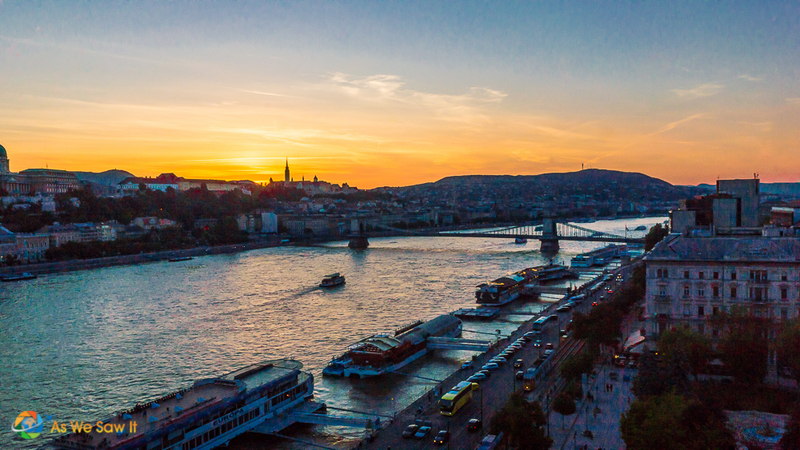 We agree, Budapest is fabulous! River cruises have become so popular and I’ve never heard a bad review. Enjoy yours! A lot of people on our cruise were river cruising for the first time. Everyone seemed to enjoy themselves. Linda, your post reminded me of my trip to Budapest a couple of months ago. I love that city so much! It seems you did the right thing to give yourselves a couple of days there before boarding the cruise ship. 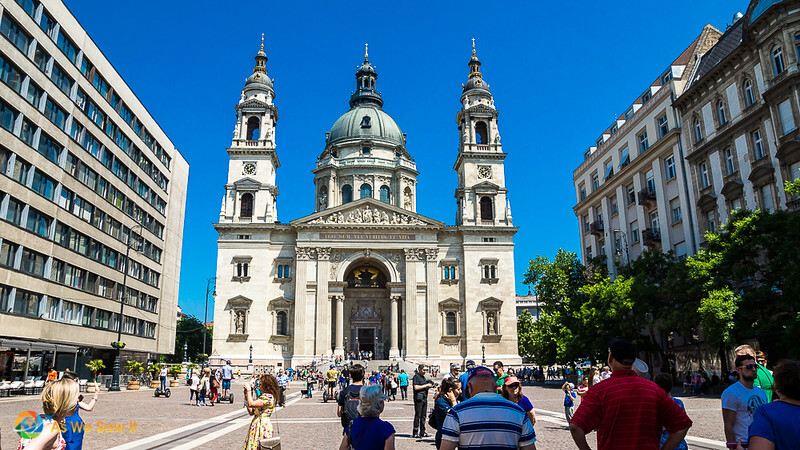 Was this your first time in Budapest? Actually, Anda, it was our first time in Hungary. We managed to fit an awful lot into 3 days and all I can say is Wow. I feel we just touched the surface of what Budapest has to offer. Must. Go. Back. Just curious: Do Viking’s river cruises offer more time for exploring than a traditional at-sea cruise ship? I don’t enjoy cruising because I don’t like being so limited for time and forced to eat on board but I’m considering trying a river cruise at some point. What is a typical daily schedule like? I’d say yes, they offer more time for exploring. River cruises focus on time in port instead of time on board. Plus, every day has at least one stop (nothing like days at sea) where you can get off and see the sights.